(NewsUSA) - Shopping for school supplies isn't what it used to be. Sure, kids still need notebooks, binders and pens -- but they won't survive without the latest technology either, namely a computer. According to a recent survey commissioned by HP and conducted by Wakefield Research, computers become a significant part of homework assignments for children as young as 10 years old and students aged 6 to 17 spend at least three hours a day on devices with Internet access. However, that much computer use at such a young age raises some concerns among parents. "If your child is about to hit double digits, computers are going to be a routine part of their afterschool homework," explains Kevin Frost, Vice President, Volume Business Unit, HP. "HP shares parents' online safety concerns and offers a variety of desktop and notebook PCs with some exclusive offers and deals for students getting ready to go back to school." Can kids have fun and be safe online? Most parents want to guarantee safety instead of hoping for it. The survey reported that more than 28 percent of parents have more faith in giving their child a credit card at the mall than leaving them home alone on a computer. In fact, over a third of parents surveyed believe children cruising the Internet unsupervised have more potential for danger than kids staying at a friend's house without parental supervision. Despite these fears -- and the reality that prolonged computer usage is the norm for many students -- 66 percent of parents don't take simple steps to protect their children online, such as using parental control software, and 67 percent don't block websites they deem inappropriate. *	Select the right computer. To keep an eye on young children's computer use, consider a family desktop PC that you can keep in a centralized location in your home. For example, HP has two desktops with student-friendly features and a 60-day Norton Internet Security trial -- the Pavilion 23 All-in-One and TouchSmart 320 All-in-One (www.shopping.hp.com). *	Use parental control software. Be aware of what your kids are doing online, by setting time limits and restricting inappropriate websites. 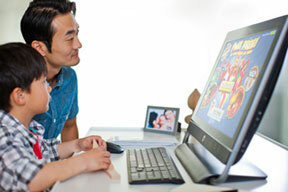 Select HP PCs come with up to two years of Norton Internet Security at no charge. *	Talk to your kids. Your kids may be "digitally savvy," but that doesn't mean they don't need to learn some Internet safety lessons from Mom and Dad. Talk to them about not sharing personal information or clicking on suspicious links. If they don't already, your child will soon rely on computers for much of their homework needs.